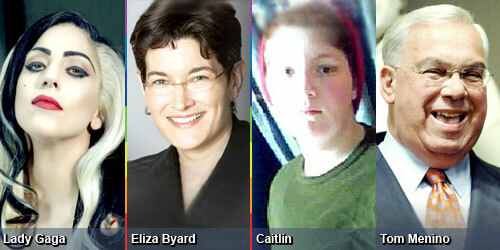 – Eliza Byard, executive director, GLSEN, Gay, Lesbian & Straight Education Network, responding to a question from the father of a 13-year-old son who came out to his parents and has already made the news public at school, in Dan Savage’s advice column, http://www.thestranger.com, Jan. 17. “My daughter’s foundation was born out of her passion to create a better world where people are kinder and nicer to one another and are accepted for who they are, regardless of how different they may be. She has experienced many of the struggles that our youth encounter today, and identifies with the lasting effects they can have without proper support. Together, we look forward to creating a new movement that will engage and empower youth and accept them as valuable members of our society. -Cynthia Germanotta, Lady Gaga’s mother, in a press release titled “Lady Gaga to Officially Launch Born This Way Foundation at Harvard on February 29,” about the Born This Way Foundation (BTWF) that will explore the best ways to reach youth and create a new culture of kindness, bravery, acceptance and empowerment, and address issues like self-confidence, well-being, anti-bullying, mentoring and career development and advocacy, http://cyber.law.harvard.edu, Jan. 19. -Caitlin, in a posting on “genderqueer – beyond the binaries” blog site, images of gender-bending, trans and queer people of all sorts, meant to empower and celebrate the beauty within all gender expressions, http://genderqueer.tumblr.com, Jan. 21. -Boston Mayor Tom Menino, in the blog titled “Launch of Mayors for the Freedom to Marry,” about a new initiative titled Mayors for the Freedom to Marry, initiated by Freedom to Marry to demonstrate the wide, non-partisan support for marriage equality across the country, http://www.freedomtomarry.org, Jan. 20. Freedom to Marry is the national organization working to expand public support for ending marriage discrimination.